Scott Olson / Getty ImagesUnited quickly moved from an initial offer of a $US1,000 voucher to a $US10,000 voucher. A United Airlines passenger was offered a $US10,000 voucher after she was bumped from an oversold flight. She also allegedly received two $US10 meal vouchers, but was unable to land access to the airline’s lounge. 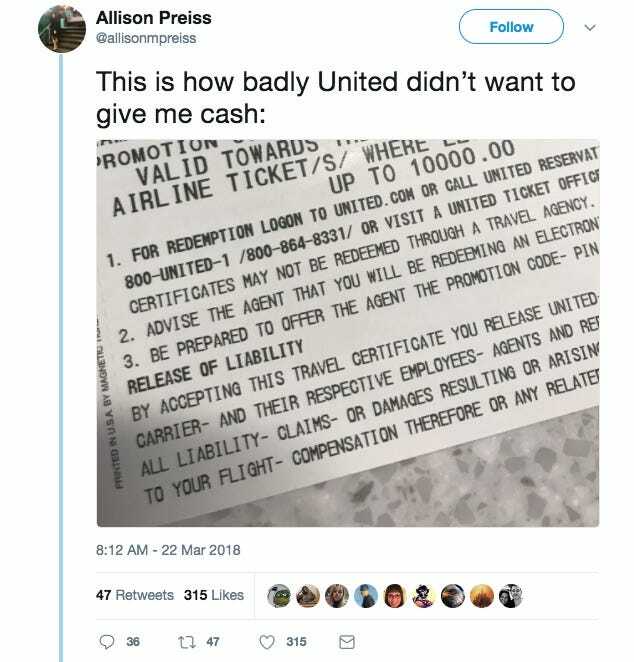 Nearly a year after United ignited controversy for dragging a passenger off an overbooked flight, a Twitter thread from one of the airline’s passengers shows just how far the airline will go to avoid another incident. According to tweets posted on Thursday, Allison Preiss was set to fly from Washington, D.C. to Austin for a friend’s bachelorette party when the airline announced that her flight was oversold. According to Preiss, United offered a $US1,000 travel credit to anyone who volunteered to wait for another flight. After no one took the offer, Preiss was allegedly bumped. “They are kicking me off this flight,” she tweeted. 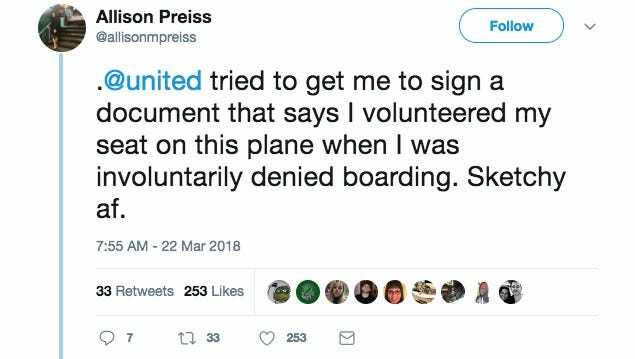 United then allegedly offered Preiss $US2,000 in travel credit and tried to get her to sign a document asserting that she volunteered to give up her seat on the flight. According to Preiss, she asked for cash instead. Eventually, United offered Preiss a $US10,000 travel credit, which she accepted. 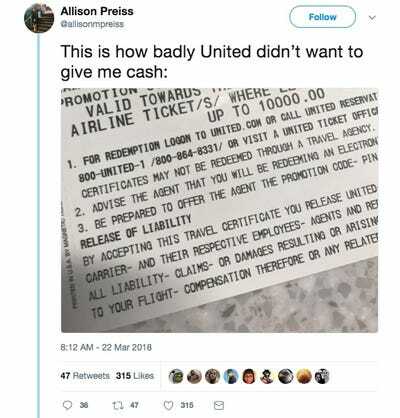 “This is how badly United didn’t want to give me cash,” she wrote above what appears to be a photo of her $US10,000 voucher. 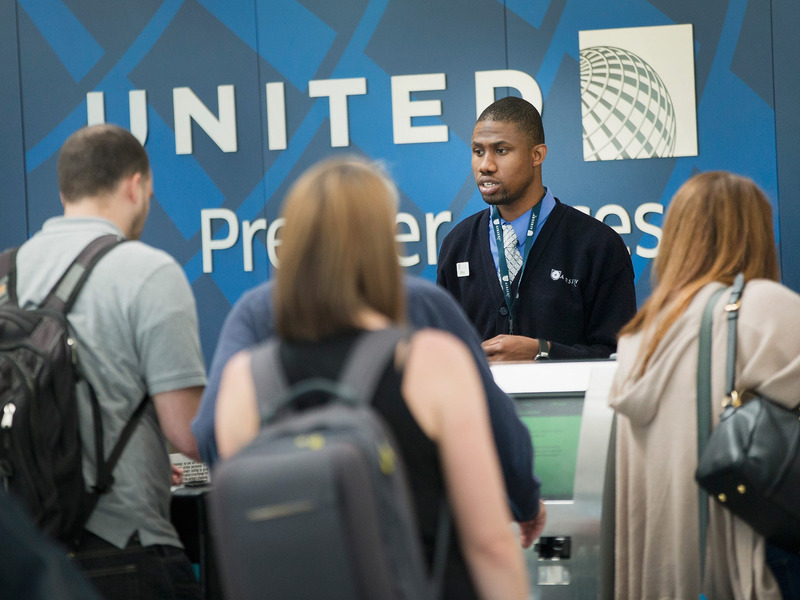 “We issued this voucher per our policy,” United told Business Insider in an email. According to Preiss, she also received two $US10 meal vouchers, but was unable to land access to the airline’s lounge. “On the upside, I wasn’t physically dragged off the plane and my dog wasn’t killed on board,” she wrote. In the past year, United has been unable to avoid customer service scandals. Last week, the airline had three dog-related incidents in which one died in the overhead bin of a United flight and two were sent to incorrect destinations. In response, the airline announced that it would temporarily stop transporting pets in the cargo holds of its aircraft while reviewing its PetSafe program and mark pets travelling in the cabin with brightly coloured bag tags.